The St. John Guidebook has been in print since the mid-1980’s. I came on board to write under new ownership for the 2014 edition. (Wiggled my way in to laying out the pages I write too.) I’ve been involved every year since. It has always been a fun and cheeky publication, based on the silly cartoons of its founder, Linda Smith Palmer. Oh, how we giggle every year looking through her illustrations. Design Guidelines are loose other than: the more color, the better! It’s a directive I can easily follow. My main goals on the pages I lay out are to maintain a sense of order and make the information easy and enjoyable to read while still providing the vivid Caribbean color experience on the page. I am particularly proud of our revised Historical Timeline of St. John (super serious and accurate version), printed for the first time in the 2017 edition. Tackling the island’s history was a big project. For one, it’s always a challenge to condense centuries of history into six pages AND to make it entertaining. … 1500-1700 – BYE, NATIVES. I did all the writing and research for the timeline and laid out the pages. Illustrations are by Linda Smith Palmer and Denise Barbier. For part of my time on St. John, I had an indoor/outdoor lifestyle on the most remote part of the island. I spent a lot of time with hermit crabs who lived in the yard. 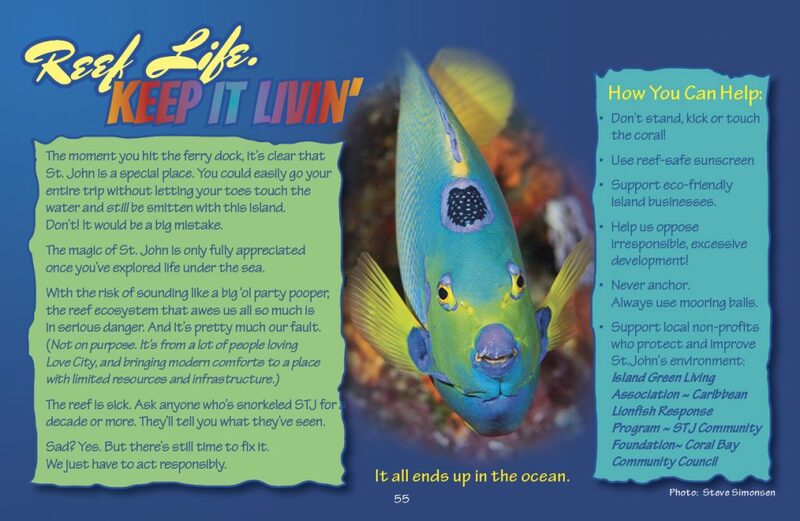 It was during this life chapter that I suggested we do a fun little info piece on these ubiquitous (and adorable) island creatures. You can’t spend any amount of authentic time on an island without coming into contact with the many creepy crawlies that call the place home. 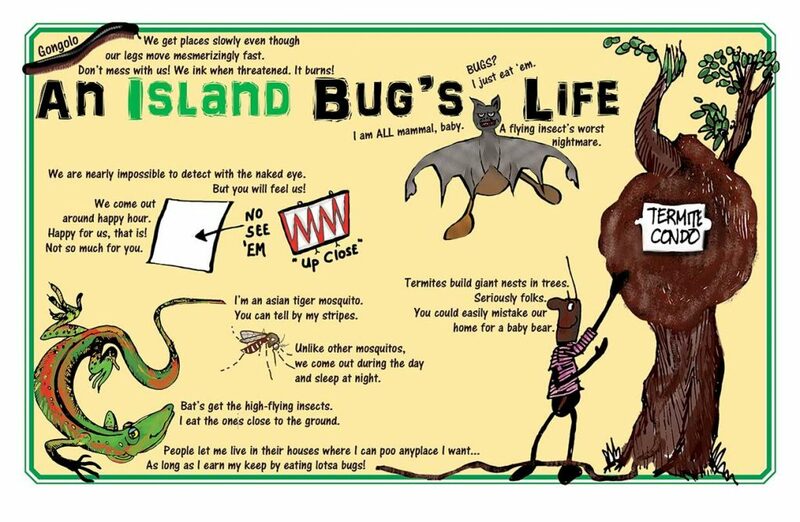 As such, this is our ode to the bugs of St. John. Damage to the reef is a major problem in the USVI. I thought it necessary to address this growing concern with the St. John Guidebook’s platform and large distribution. The challenge was to create awareness and understanding while not sounding like we’re blaming any single group of people. Also, we wanted to offer ways that people can learn more and help out. 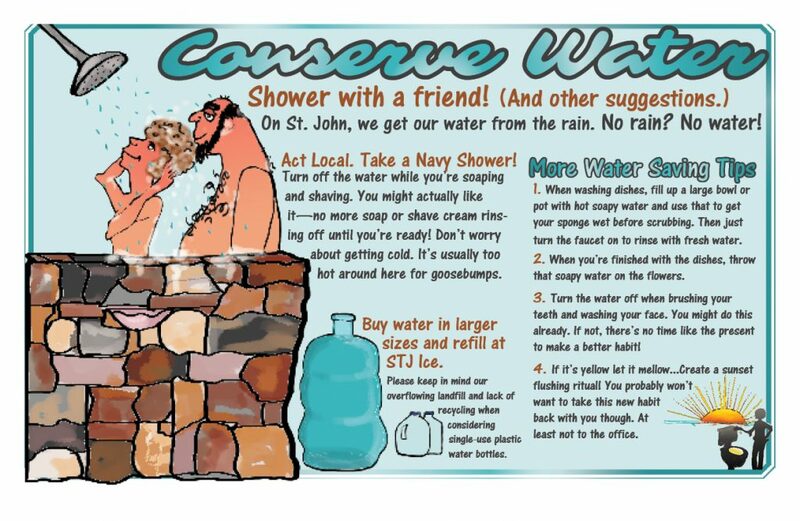 Another important thing to know about staying (or living) on an island is that water conservation is real and necessary. This page explains why and gives tips on how to save water like a local. These are just a handful of the layouts + writing I’ve done for The St. John Guidebook. You can see the most recent publication in e-form at the Island Treasure Maps website.